EVLT (EndoVenous Laser Treatment) has been an established, safe, and effective technique for the treatment of Varicose Veins for many years. 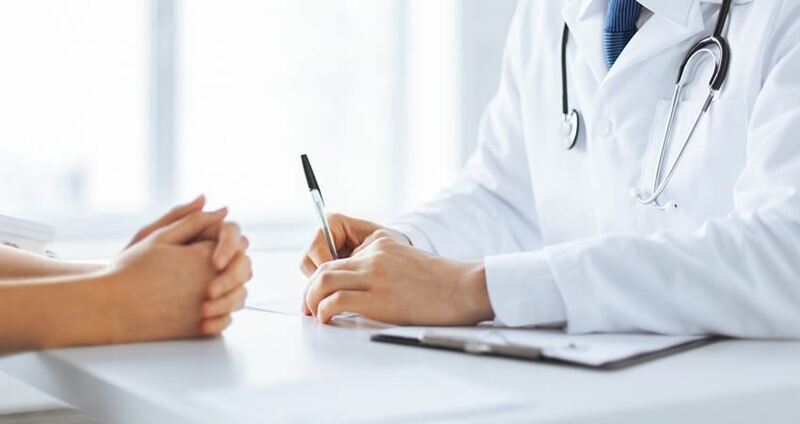 The advantage over surgery for treatment is that it is minimally invasive - the treatment can be carried out with small incisions, catheters and without the need to be put to sleep. EVLT is a procedure carried out in a procedure room as opposed to an operating theatre. The patient undergoing treatment is usually awake throughout the procedure and local injected anaesthetic solution is used to make sure that the treatment area is numb. Firstly you will be taken to a changing area to change and be measured for compression stockings. These stockings will be provided to you, to keep, as part of the treatment. They will be put on your leg after the laser has been used to "ablate" the veins, and before you leave the procedure room. Once you are changed and measured you are guided to the procedure room and onto the treatment couch. Your surgeon will clean your leg with sterilising solution and then scan your leg with an ultrasound. 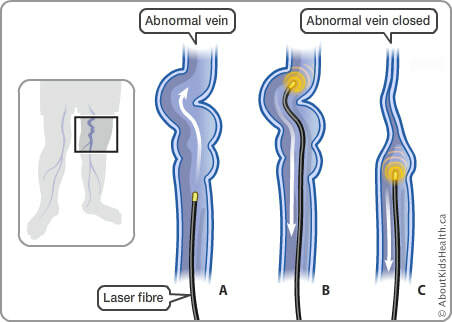 The vein to be treated is accessed with a needle after local anaesthetic injection and then a small tube, a sheath, is inserted over a wire so that the laser catheter can be positioned within the vein to be treated. Both legs can be treated at the same session, and a sheath will be inserted at this stage for each vein to be treated. Once the laser catheter has been placed at the correct point in the vein, the vein and its surrounding tissues is injected with local anaesthetic solution. After final checks for position and numbing solution, the vein is treated with the laser for its length. Laser protection goggles need to be worn during laser deployment. After the vein or veins have been treated, paper stitches are applied and the compression stocking is put on before the patient is got off the couch to change and go home. A member of the CVG team will make contact with you in the first 24 -48 hours after to check your progress and to organise an appointment for you for about 6 weeks after the treatment. By that time most of the bruising will have settled and the clinical result can be assessed by your specialist. Not uncommonly some of the depressurised varicose vein branches will benefit from additional injection treatment to get the best cosmetic result - this is included in the treatment and is virtually painless. Before EVLT you will be seen and assessed by a specialist vascular surgeon and will have had a detailed scan of your veins. The scan is performed to ensure that your veins will be appropriately treated by endovenous methods. Your surgeon will be able to describe the findings of the scan and the laser treatment. You should feel free to ask any questions about your treatment until you are satisfied that it is right for you. The procedure will be booked on a convenient date by the CVG administrative staff. You will be given all the information you need for your insurance claim but usually CVG can organise approval directly. Once the treatment has finished and you are up and walking, you will be given instructions on how to manage the after treatment period. It is important for you to maintain frequent walking exercise, and this should be a regular feature of the weeks after treatment. The need for compression is variable; you will be give specific instructions depending on the veins that have been treated. Usually, you should wear the provided stocking for the first 48 hours continuously. Following that first period, you should wear the stocking during waking hours for a variable period between 5 and 10 days. Many people find that even after the prescribed period, the compression can help relieve some of the mild to moderate discomfort that is experienced from the treated vein. Although laser treatment of varicose veins is well tolerated, there is a period in the first 5-7 days that the patient will have mild to moderate pain, redness, bruising and swelling . Simple analgesia medications is all that should be required; like paracetamol or ibuprofen, both available as over the counter tablets. It is advisable to take these regularly during the first couple of days.